Due to reconstruction of a part of the platform in the Muzeum station of metro line A, the platform for the direction to Depo Hostivař will be closed from the launch of the operation on Tuesday, the 11th of July 2017, for cca. 5 months. For a ride to the Muzeum station in the direction from Nemocnice Motol, it is necessary to travel up to the Náměstí Míru station and subsequently change to a train in the opposite direction. 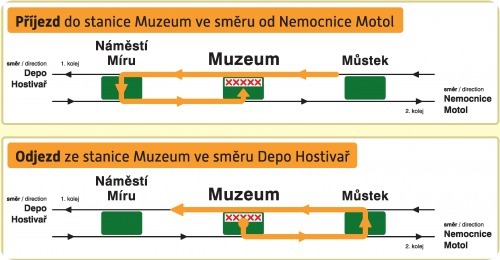 For a ride from the Muzeum station in the direction to Depo Hostivař, it is possible to use a train in the direction to Nemocnice Motol and subsequently, in the Můstek station, change to a train on the opposite side of the platform.